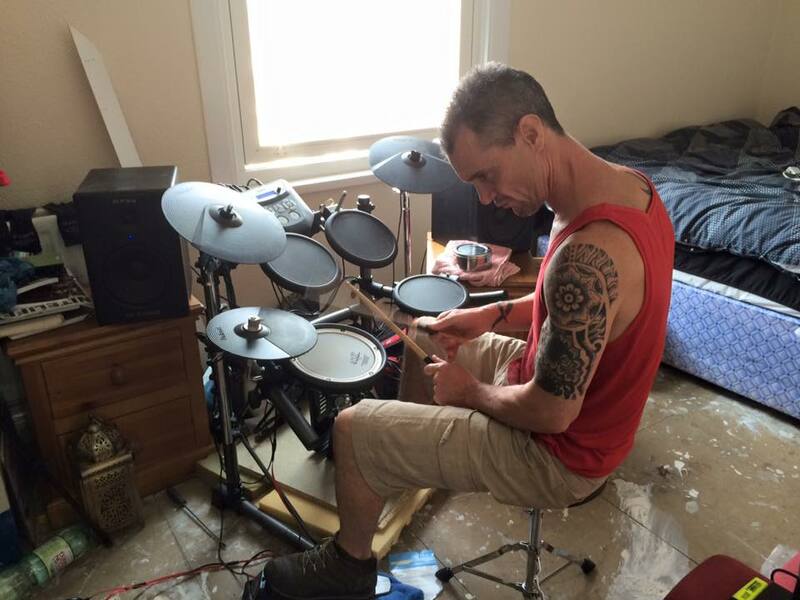 Colin is a father, a drummer, an assistant film maker and a dancer. He enjoys community, nature, music and the company of good people. The Sponsorship Fund is supporting him to continue to heal emotionally and spiritually and to recover from his early life traum. Colin couldn’t stand to be in his own company without hurting himself and so he travelled through the revolving doors of psychiatric units, jails, de-tox units and intensive care. ‘Self-loathing was the norm. I never did really discover how to ‘do my own life’. 20 years ago, Colin fell from a roof 3 storeys high ‘I fell, however I simply let go. I could not physically hold on any more due to the amount of drugs in my system, and spiritually I was dead inside. I could not live another day of my life’. Narrowly missing death, and with grievous injuries, his long road to recovery began. More recently it has been recognised that Colin has Post Traumatic Stress Disorder, with its origins in his childhood trauma, compounded by what his system had to cope with from his own behaviour: violence, drugs and alcohol abuse. ‘I eventually got clean and sober. However I was hit with a tidal wave of emotions the size of a mountain, some of which I never knew existed, emotions that I had suppressed and pushed down forever’. From street sleeping, Colin moved to live in hostels, supported accommodation, and in mental health residential facilities, progressing to a ‘low support social housing unit’. 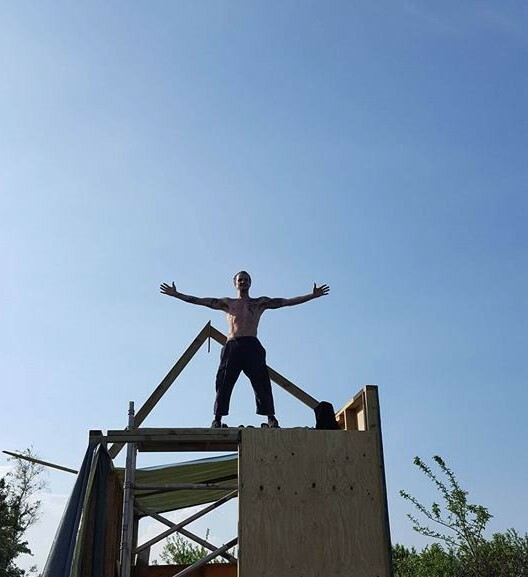 He engaged with the AA’s 12 step programme, where he was supported by other recovering addicts to face and start learning how to cope with himself. Being in nature and communal living helped him to find connection, a ‘family', and continue to heal emotionally and spiritually. 3 years ago he began to go to Movement Medicine sessions offered by Apprentice Teachers, Ali, Rob, and Jurek, and ‘loved it!’ Eventually, encouraged by the people he met dancing, he went to an intensive weekend workshop with Caroline Carey Cole and Rosie Perks, called Re-generation. ‘That weekend and those women instilled some kind of faith within me. It wasn’t re-instilled, it was just instilled, like a brand new plastic wrapped discovery. I thought “Man, there are nice people out here! IT'S TRUE. It’s not a lie, it’s true, it really is actually true. My God!” The weekend was magical for me. Not all roses - it was challenging, but magical none the less’. He has attended further workshops, supported by organisers and teachers offering him free or low cost ‘assisting’ places. Supported by the Sponsorship Fund, and mostly paying for himself out of his limited state benefits, he is now participating in a yearlong group called the Journey of Empowerment. Colin hopes to be able to go on to train to teach Movement Medicine. Inspired by a weekend workshop with Ya’Acov he thought: ‘This is what I want to do, I want to be this; I want to live in this truth; I want to be and share this. I want to be a Movement Medicine Teacher’. Ongoing intensive workshops and the training to become a Movement Medicine teacher are a costly. If Colin and others like him are to achieve their dreams of receiving the ‘Medicine’ and then giving it back, the Sponsorship Fund needs generous support. Please give all the help that you can. How do you claim your space to move and dance and be at the centre of your own circle in a context where there is inequality or injustice or violence or discrimination or war? The Movement Medicine Sponsorship fund exists to enable teachers and practitioners of MM to take the medicine into areas where, for economic, social or cultural reasons people would not normally be able to access it. Currently, the fund is active in supporting people in Israel/ Palestine, in South Africa and Europe. To give you a flavour of this work, below are some stories about this. Interview with Ben and Samar June 2015. The first thing I’d like to ask you, Ben, in terms of the peace work you’ve been doing in Israel/Palestine, what is the connection between that and Movement Medicine (MM)? In what ways is MM connected to that work? In every way. In two forms. The general work that I do in Palestine/Israel I would call MM facilitation. It’s the bedrock of everything I do, whether that’s direct action in the west bank, or working for Combatants for Peace, or running workshops with Israelis and Palestinians, or leading direct movement workshops with Israelis or Palestinians or a mixture. So all of it is MM, and it comes in all those forms and it’s all informed by MM as a practice. I just started doing the work, I haven’t been doing it for a long time. For me it’s more of a vision that’s actually starting to manifest itself, because it’s all new to me, bringing it and offering it to other people, I started just dancing, because I love dancing, I want to dance and connect. So that’s how it started with me. It was just me and my younger sister who met up with S and Y while they were still teaching 5R. We would attend these big workshops with everybody in the room Jewish Israeli. And by then it made me wonder, how can we bring this more to our community, and how much we need it as a community but also as individuals and in our case as women. Because culturally it’s very challenging for us to dance and express ourselves and express our bodies, not to mention men, of course. And how would you see that work developing, how would you like it to develop? I remember when I was with Ben in Bethlehem, which is in Palestine, the occupied territories, and he said simply, ‘This is your space, nobody can take it away from you.’ This little sentence made me think, ‘Uh-uh, are they thinking this is really my space? Nobody can take it away from me? And in a few minutes or a few hours there could be a siege or something could happen, and even this small room would not be my space and I would not be free to move in there.’ So I just want to emphasise that it’s very important for us to reach out for this medicine and to do the work together, Israelis and Palestinians, in Israel and Palestine. And this should be parallel work because of the whole issue of superior and inferior, and majority and minority. I think we should meet at a point where the medicine is available in the same measure. Because at this moment I feel (and I believe it’s true) that the medicine and the dance and the freedom of movement and the connection to your body autonomy is very accessible to the Jewish Israeli people, more than to the Palestinians. I feel it should be balanced before we do joint work, for the work actually to mean something. Of course we have already started doing joint work. But for it to bring up the change that we want it to bring, for the medicine to heal the bigger picture and the conflict, the deep conflict, I think we should start in a place where we are equal, at least in our movement. And both of you, to what extent would you say the sponsorship fund has enabled this work to happen? I think it’s enabled it to a large degree. I think it’s good to break down the things that have happened over the last 4-5 years. Three times I’ve been supported by the sponsorship fund. What Samar speaks about is a vision and I’m going to talk a bit more about the structure. In the last few years when S and Y came to Israel and I’ve been assisting them we decided to go to the west bank. Samar wasn’t involved at that point. By all accounts it was the first time that dancing happened in the west bank. And that was with Combatants for Peace, it was the start of taking the work beyond the green line. And then after I qualified as a teacher and Y and I ran a last session together in Beit Jala, near Bethlehem, which was a really magical session together- beautiful- When I started to do the work I was very clear that I wanted to involve Samar in the work with me. Because, we’re sitting here all friendly, but we’re enemies really. Her whole family was kicked out from her land because of my ancestors. We need to understand that. It’s not normal what we’re doing here. It’s not usual that we’re talking about working together in this way, because her ancestry was affected directly by my ancestry So when she speaks about space it’s a big thing. I know you all appreciated that. We made a relationship with an organisation in Bethlehem that ended up with two dances, one very small with 5 people, and the next with 30 young people. It was like walking into any city but it was wonderful. Young people under the age of 25 coming and dancing. I’ll just give a little anecdotal story. There were quite a lot of people standing by the wall, like in a disco, thinking ‘What’s this weird music?’ And Samar came to me and said, ‘What do we do?’ So I said, ‘Just dance.’ So she walked in and did what she does, and she was really worried that they were all going to copy her, but they went, ‘OK, so that’s what we do,’ and they all got up and danced. I put on some music with a bit more beat. We had two hours of really funky dance and that was beautiful. And we’ve been doing some workshops in Haifa that Samar organised. The numbers have fluctuated but it’s been beautiful. The work I do for Combatants for Peace is always joint work with Israelis and Palestinians. We did a workshop in Jericho which had the largest number of Palestinians of any workshop in Israel. But also the work was very specific. The subject was conflict, so it was framed in terms of the subject we were working with. We didn’t talk about the conflict, but we talked about conflict. So the sponsorship fund assisted me to get there; assisted me to plain and think about this; and assisted me to think about the strategy within which to achieve the vision that Samar was speaking about, and how we can do that together.